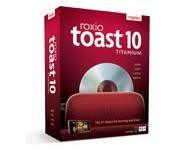 Roxio announced the availability of Toast 10 on Monday. I obsessive-compulsively try to keep my software up to date (sometimes at my own peril, as some software degrades rather than improves). When it comes to the multitude of freeware software packages on my computer, that's no problem. But software like Toast introduces a monetary incentive to counteract my compulsion by not upgrading. I've actually been using Toast 8 for a while. I completely ignored Toast 9 for a couple reasons that always make me hesitate. First, Roxio has absurdly expensive upgrade costs. The best incentive you're offered is a $20 mail-in-rebate; on a $100 product, that's not very much. Secondly, Toast's feature set hasn't exactly grown in leaps and bounds; the core functionality that most people utilize hasn't changed in years. What you're left with is the proposition of paying 80% of full cost for a few bells and whistles—that may or may not even be useful to you. That's why last time I simply stayed at the version I had, kept the $80 I worked to earn, and still ended up with the same burning capabilities that I actually cared about. But now that I've sat out a dance, it's time to see if my potential dance partner has gained the moves to sweep me off my feet. To begin with, I've ruled out the new "Pro" version as an upgrade option, since I don't need the apps it supplies. If you do, then clearly you might want that $129.99 edition (yes, the rebate stays the same despite the increase in price, further reducing the value proposition). Taking a glance at the "Why Upgrade" matrix, I can knock off Blu-ray disc authoring and the "Pro" apps. I'm also ignoring the ambiguously "improved" features that existed in previous versions, because that's not telling me anything about how that "improvement" benefits me. I don't have a AVCHD camcorder sadly, so the features that deal with that are a non-starter for me. Syncing is an interesting capability, but I thought that was already half covered by the inclusion of Déjà Vu in earlier versions. The ** footnote following the clip extraction basically says "nope, not on those commercial movie discs you bought,"making that a little dull feature. But the audiobook CD conversion is nifty. Capturing streaming Internet audio isn't something I'd use and even if I did, I'd more likely use a program designed for that task (Radioshift anyone?). Likewise, editing audio is something I probably wouldn't use. The conversion and automatic transmission to iTunes is boring because iTunes can convert for you anyway. Saving web video is slightly interesting, but again I don't have a AVCHD camcorder and EyeTV can already clip out unwanted sections inside its own software. The quick synopsis for this upgrade (when it comes to me and I highly doubt I'm alone) is that I'd pay $80 for folder syncing, audiobook CD conversion, and web video collection. Once again, a Toast upgrade fails to impress me. If Roxio cranked the price back to about $20 or $30 per yearly upgrade, I might feel justified in shelling out each time to keep up. As it stands, I think I'll stick with 8 and save another $80.